1. Bora Bora island situated near Leeward group of the Society Islands of French Polynesia. It is considered to be a honeymoon paradise. Recently it has been awarded as the best island in the World by the US news channel. 2. Bora Bora Island is the most romantic island among all the islands of the world. Bora Bora also has Mount Otemanu that will add another grace to the beautiful place. You must also read about best beach cities in the world. 3. The place earns the name in the luxury resorts also that is situated on the island. Every resort has its own importance in the way the way they are designed and situated near the island giving you an extraordinary and romantic experience you will ever have in your lifetime. Florida Beaches also known for there magnificent beaches. 4. The people of Bora Bora island speak French and Tahiti but the marketplaces, resorts, and various tourist locations people are speaking English very fluently. 5. There are certain things which you can basically plan while going to this beautiful island. 6. Firstly, you have an amazing experience of snorkelling and diving. Secondly, there are various fun activities at the Bora Bora Island like Whaler, wave runner, jet ski, and dramatic sunset cruises. Bora Bora is also a great shopping place. 7. You can find both local and international perfumes, art, oil and wooden handicrafts. You will not find any public transport on the island. So if you want to travel you only have two options for rental cars and bicycles. Along with Bora Bora, you should know about some facts about Kyoto city in Japan. 8. The economy of the island is basically driven by tourism only. The majority of visitors that visit are Americans, Japanese and Europeans. You must also consider the best islands in Greece to visit. 9. 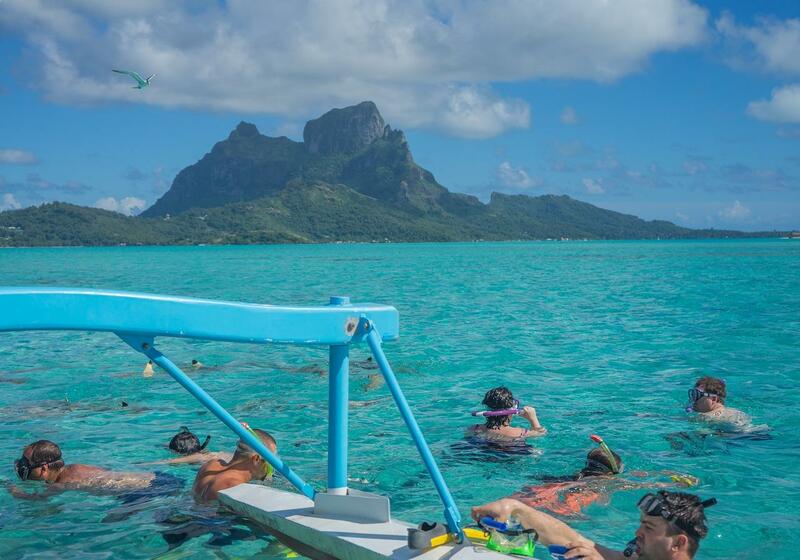 There are many activities that you will find cost-free in Bora Bora like swimming in lagoons, playing with dolphins and shark and last but not the least enjoying the beautiful sunset. There are about 9 thousand people living in the Bora Bora Island that are very much familiar with the culture, myth, and tradition. After Bora Bora, islands in Thailand attracts millions of visitors in a year. 10. They are very friendly and love to share their experiences with the coming visitors. In order to reach Bora Bora island you will first have to reach Tahiti and from Tahiti, you can find many flights that land you directly to the Bora Bora islands. There is a small airport located in the north of the Bora Bora Island. Below are some more beautiful pictures of Bora Bora islands. Carribean islands can also be considered as a substitute for Bora islands. 11. The island is surrounded by waters for about 230 kilometers (143 miles) northwest of Papeete. Also, you will be able to see lagoon and a barrier reef. 12. Among all the islands native to French Polynesians, Bora Bora islands is considered to be most romantic one. 13. The island is surrounded by several beautiful islets that include Motu Tapu, Motu Ahuna, Tevairoa, Motu Tane, Motu Mute, Motu Tufari, Motu Pitiaau, Sofitel Motu, Motu Toopua, and Toopuaiti. 14. The island in Tahitian is known as “Pora Pora” (which means “first born”). 15. There are NO poisonous snakes or insects in French Polynesia or Bora Bora islands. These are the things you should know about amazing Bora Bora Islands. Do post your comments.